Tender flank steak, red peppers & onions inside warm corn tortillas, topped with fresh Pico de Gallo. 3 ways to cook the steak – Broil, Grill or Sous Vide. If you haven’t already, prepare some Pico de Gallo and set it in the refrigerator while you prepare the tacos. Heat about 1 tsp of the olive oil in a large skillet over high heat. When the oil just begins to smoke, add about half the peppers and onions. Using a wooden spoon, spatula, or tongs, toss the vegetables around in the hot oil for a few seconds. Sprinkle with salt and pepper. Continue to toss until they are crisp-tender and blackening in spots. Remove from the pan to a plate and repeat with remaining peppers and onions. Combine all the spices, salt and pepper in a small bowl. Rub each side of the flank steak with 1 to 1 & 1/2 tablespoons of olive oil. Rub the seasoning into the steak, coating it on all sides. To grill, on an indoor or outdoor grill: Preheat the grill – you want it to be hot. Grill the steak to your preferred level of doneness. Medium-rare (140-145 degrees) will take approximately 6 minutes. Medium (155-160 degrees) will take just a couple of minutes longer. On an outdoor grill, cook 4-5 minutes on one side, flip and cook another 3-4 minutes. Try to remove the steak from the grill a right before it reaches the desired temperature because the steak will keep cooking for a bit after you remove it from the heat. To broil: Set a rack in the top third of you oven and preheat the broiler. Line a broiler pan with aluminum foil and spray the top with nonstick cooking spray. Broil the steak 4 to 6 minutes per side. Sous Vide Method: Pre-heat water bath to 135°F, for medium-rare or 145°F for medium. Vacuum seal the flank steak or place it in a heavy duty Ziploc bag and squeeze out as much air as possible. Place bagged flank steak in water bath and cook for 2 hours. No mater which cooking method you choose, let the cooked steak rest for 5 minutes on a cutting board to let the juices settle. Slice the steak as thinly as possible across the natural grain of the meat. 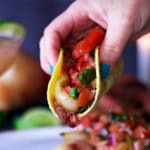 Serve tortillas with sliced flank steak, sautéed vegetables and Pico de Gallo, letting each person build their own tacos. Prepare the Pico de Gallo first, before preparing the tacos. This will give it some time for all the flavors to marinate before serving. Pico de Gallo can be made up to 3 days ahead of time, stored in a covered container in the refrigerator.